Since 2011, Donald Trump has been perpetuating the lie that Barack Obama was born outside the United States. Trump became a leader of the so-called "birther" movement in order to promote himself as a potential presidential candidate, exploiting the racism and paranoia of many Americans who are now supporting his campaign. Trump's "birther" efforts were designed to question the legitimacy of America's first black president. Even after Obama released his birth certificate from Hawaii -- something no other president has ever felt compelled to do -- Trump continued to play the "birther" card. After spinning this lie for many years, last week Trump reluctantly acknowledged that Obama was born in the United States, although he refused to admit that he had been lying about this for years and refused to apologize to Obama. Despite his turnaound, Trump can't take back the damage he's done by repeating the falsehood to bolster his political ascendancy. The "birther" lie confirms the harsh truth often attributed to Joseph Goebbels, Hitler's propaganda chief: "If you tell a lie big enough and keep repeating it, people will eventually come to believe it." A new NBC News poll conducted in June and July found that 72 percent of registered Republican voters still doubt President Obama's place of birth. And 41 percent outright disagreed with the statement, "Barack Obama was born in the United States." Earlier this week, 51 percent of voters who back Trump said Obama was not born in the U.S., according to a YouGov/Economist poll. Overall, 71 percent of all adults correctly believe that Obama was born in America. By forcing the media to ask questions about Obama's birthplace, Trump has cleverly deflected attention away from his own ancestry and origins. At no point during this campaign has a reporter asked Trump where he was born or to prove his citizenship with official documents. After an exhaustive investigation, I have discovered evidence that Trump does not want the country to see. I have learned the location of Trump's birth. He was born on third base. In popular parlance, "born on third base" means that someone was born to privilege. Many people who were born on third base acknowledge that it provided them with significant advantages throughout their lives. But Trump -- like some other heirs to big fortunes -- refuses to discuss his birthplace. Is he ashamed of his origins? Or does he fail to realize that Fred Trump, a wealthy developer, was not only his father but also his manager and third base coach. It's rich people like Trump that led football coach Barry Switzer to quip: "Some people are born on third base and go through life thinking they hit a triple." At the 1988 Democratic convention, former Texas Agriculture Commissioner Jim Hightower used that line to excoriate George H.W. Bush, whose father was a wealthy Yale graduate and one-time U.S. Senator. Now Chuck Collins, great-grandson of meatpacker Oscar Mayer, has written a book, Born on Third Base, explaining why people like Trump are able to fool themselves -- and perhaps others -- into believing that their success was due entirely to their own hard work. Obama has always told the truth about where he was born. But Trump has consistently lied about his birthplace on third base. Despite this, Trump's fabrication has not become the fodder for news stories or an issue in the presidential contest. That seems like a real double standard. During his presidential campaign, Trump has claimed that he made it on his own. When pushed, he acknowledges that his father loaned him what he's called the "small amount" of $1 million. In fact, Trump inherited his father's real-estate empire worth tens of millions of dollars, made by building middle-class housing financed by the federal government. Earlier in Donald's career, his father paid his son's debts. Donald also took several massive loans from his siblings' trust funds. One can see Trump's entire life as one of entitlement. But we can also see, in Trump's personality, someone who recognizes that he does not deserve his success. He is obsessively insecure and thin-skinned about his intelligence as well as about his manhood, and about his own accomplishments. In 2004, in an interview with CNN, Trump said, "I went to the Wharton School of Finance. I got very good marks. I was a good student. It's the best business school in the world, as far as I'm concerned." Trump has repeated that claim many times since. Each time, it isn't clear if he's trying to convince his interviewer or himself. In 2011, in another interview with CNN, Trump said: "Let me tell you, I'm a really smart guy. I was a really good student at the best school in the country," referring to the Wharton business school at the University of Pennsylvania. "I went to the Wharton School of Finance," he said multiple times during a speech last year in Phoenix. "I'm, like, a really smart person." In an interview on NBC's "Meet the Press" last year, he described Wharton as "probably the hardest there is to get into." He added, "Some of the great business minds in the world have gone to Wharton." Only someone who questions his own intelligence would feel compelled to make these public statements. Trump surely knows that he didn't get into Wharton on his own merits. He transferred into Wharton's undergraduate program after spending two years at Fordham University in New York. But Trump's grades at Fordham were not good enough to transfer to the University of Pennsylvania, the home of the Wharton School. In her 2001 biography, The Trumps, Gwenda Blair wrote that Trump got into Wharton as a special favor from a "friendly" admissions officer who knew Trump's older brother, Freddy. Moreover, a 2011 article in Salon reported that Trump has exaggerated his academic accomplishments at Wharton. According to Salon, on at least two occasions -- in a 1973 profile and in an article in 1976 -- the New York Times reported that Trump "graduated first in his class" at Wharton in 1968. That is a lie. Trump didn't even make the honor roll while at Wharton. It is likely that Trump was the original source for that falsehood, but it isn't entirely clear, since neither Times story attributes it to Trump. But the lie that Trump was first in his class was repeated in many other articles as well as books about Trump, so he clearly knew that it was out there in the public domain, and didn't bother to correct it. "He was not in any kind of leadership. I certainly doubt he was the smartest guy in the class," Steve Perelman, Trump's Wharton classmate, told the Daily Pennsylvanian, the campus newspaper, last year. "It has not been easy for me," Trump said at a town hall meeting on October 26, 2015. "And you know I started off in Brooklyn. My father gave me a small loan of a million dollars." At a news conference early this year, Trump repeated the same story: "I got a very, very small loan from my father many years ago. I built that into a massive empire and I paid my father back that loan." An investigation by the Washington Post earlier this year demolished the idea that Trump made it on his own. Not only did Trump's multi-millionaire father provide Donald with a huge inheritance, and set up big-bucks trust accounts to provide his son with a steady income, but his father also was a silent partner in Trump's first real estate projects. His father's real estate fortune was due, in large measure, to his reliance on government financing and subsidies for his middle-class apartment buildings. It was only because of financing from the Federal Housing Administration (FHA) that Fred Trump was able to revive his real estate business and build homes for middle-income families. During World War 2, Fred Trump constructed FHA-backed housing for US naval personnel near major shipyards along the East Coast. After the war, he continued to rely on FHA financing to construct apartment buildings in New York. 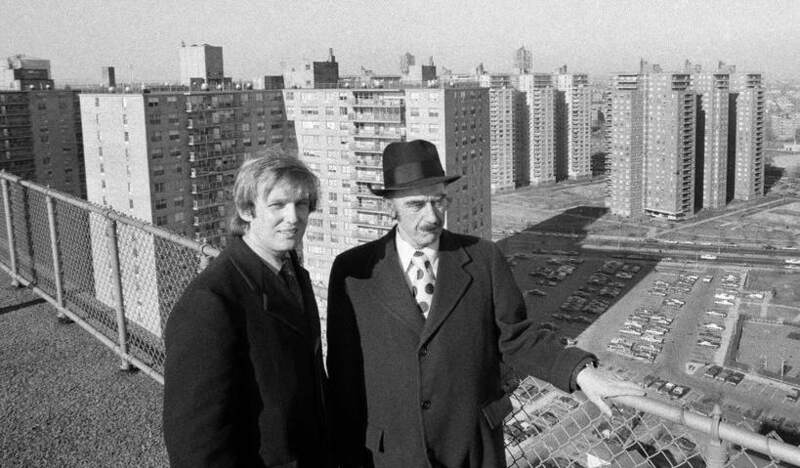 Fred Trump's real estate business was also littered with widespread racial discrimination. Earlier this year the Washington Post revealed that Fred Trump had been arrested at a Ku Klux Klan rally in New York in 1927. His racism pervaded his business practices. The federal government sued him for denying black families the opportunity to rent apartments in his buildings. When Donald went into business with his father in the 1970s, those racist practices continued, as the New York Times reported. In other words, Donald not only inherited his father's real estate empire, he also inherited his racism. Trump's first big real estate deal was the construction of the Grand Hyatt hotel, near New York's Grand Central station, in 1978. Fred Trump's Village Construction Corp. provided a $1 million loan. But, as the Post investigation explained, "that loan was only a small part of the father's involvement in the deal." "Trump's father -- whose name had been besmirched in New York real estate circles after investigations into windfall profits and other abuses in his real estate projects -- was an essential silent partner in Trump's initiative. In effect, the son was the front man, relying on his father's connections and wealth, while his father stood silently in the background to avoid drawing attention to himself." Wayne Barrett's 1992 book, Trump: The Deals and the Downfall, reveals the magnitude of his father's involvement. Fred Trump and the Hyatt hotel chain jointly guaranteed the $70 million construction loan from Manufacturers Hanover bank, "each assuming a 50 percent share of the obligation and each committing itself to complete the project should Donald be unable to finish it." Trump's father was not only his silent partner but also his safety net. In a 2007 deposition, Donald admitted that he borrowed at least $9 million from his future inheritance when he encountered financial difficulties. In effect, Donald was on welfare. The funding came from his father, not the government. But it actually came indirectly from the government, which had financed Fred Trump's real estate business. Other investigations have shown that Trump's business career is filled with multiple bankruptcies, bogus businesses (like Trump University), repeated rip-offs of suppliers, contractors and employees who he failed to pay for services rendered, and misuse of the Trump Foundation to feather his own nest while trying to look like a philanthropist. Trump has also lied about the size of his wealth, as various business publications have pointed out. Many observers suggest that one reason Trump has refused to release his tax returns is that they will show that he has repeatedly exaggerated his wealth and, thus, his success. Like Obama's Hawaiian birth certificate, the Washington Post's investigation provides the documentation confirming Trump's birthplace on third base. But even though he was born on third base, he has had to lie, cheat, and break the law in order to get to home plate.